3×4.5magnets are large and they can carry any image with aplomb. You can send them as a joy card announcing the arrival of the baby or as an invitation for a baby shower or bridal shower, etc. People would happily accept a large rectangle magnet, which fixes their gaze and enlivens their spirit. It is also perfect for music bands or fundraisers trying to catapult their popularity with minimum efforts. As said before 3x 4.5 is not a small size, which means parents, teachers and everyone who saw them would easily get drawn to school contact magnets offered to them. They would love to keep it with pride over their refrigerator doors. If you are targeting kids and their parents, then it is perfect to stick with full color play magnets. You can print some short poems or cartoon characters over these magnets for easy acceptance. It is perfect for gifting during tradeshows, play school events, community fests or through your toy stores or kids supplies. People would be happier to receive such full color customized magnets because they would keep their kids enchanted. In addition, kids would discuss it with their friends, too. They might not be new idea, but still there of themes, which can be experimented over these custom magnets. You can assimilate your main wedding theme with this magnet or use it for making your announcement special and one to watch out for in years to come. The choice is entirely yours. Discounts are big buzzwords for marketing. 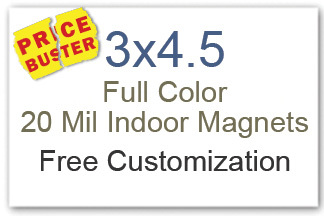 Full color magnets 3×4.5 customized with discount information will bring you more customers than ever. They would retain this discount coupon as a memoir of a large-hearted advertiser, who made their shopping an experience to remember. Free giveaways are always popular and people would love to grab them whenever you announce them. You can announce host of freebies or save or immediate call for action over this large magnet. Trigger an immediate action by printing “free gift with purchase before 1 January 2015 and so on”. This is perhaps one marketing message, which is yet to achieve its full potential. You can easily use the term to attract large clientele. You can say that “100th customer will win a day holiday to Spain” or some other equally enchanting term. It is a human tendency to get drawn to messages, which offer them more than they can expect. Triggering patriotism is the perfect way to stay closer to your customer always. You can use 3×4.5 magnets for printing patriotic messages or sending holiday wishes or July 4 wishes. People would happily retain them over their refrigerator doors as long as they can. You can figure out many more ways of personalization and value building using large magnets as 3×4.5. Only sky is the limit for creativity, while working with these customized magnets.